What differentiates the man from the beast? Clearly, MIND has been the potent force and the distinction between mankind and any-other-kind that there is. It is ultimate coordinator of all organs in the body. It is also the ultimate logic algorithm that has analyzed the world, pondered over the secrets of the nature and championed them. The human mind has also created and defined the good, bad, god, evil, heaven, hell and everything in between. Mind defines everything in this world - the weather, living things, lifeless things, dead things and ghosts. While the human mind has unraveled the mysteries of the universe, very little has it pondered on itself. Even though the word/phrase 'Tabula Rasa', sounds out-of-the-world'ish, it is the most popular and widely accepted axiom concerning the matters of mind. The theory of Tabula Rasa states that individuals are born without built-in mental content and that all knowledge comes from experience and perception. 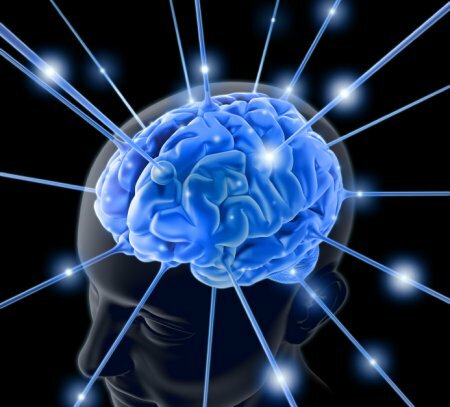 In other words, when we are born (the zeroth second of our lives) we've nothing in our heads. Our mind is a clean slate; no memories, no experience, no emotions, no knowledge, no information & no-nothing. All that the minds learns and assimilates is through our experiences and perceptions of the world. Fairly simple and believable. Lets put this to test. Test one. Consider a hypothetical scenario in which two babies (healthy and without any anomalies) are born at the same time. We know that they have an absolute no-nothing in their heads. Let's isolate them in separate test rooms. Assume that the environment in these two rooms are identical and that parameters such as temperature, humidity and lighting are similar at any point in time. Now, let's keep these two babies in their respective test rooms (without knowledge or contact of the outer world) for say, 20 years. 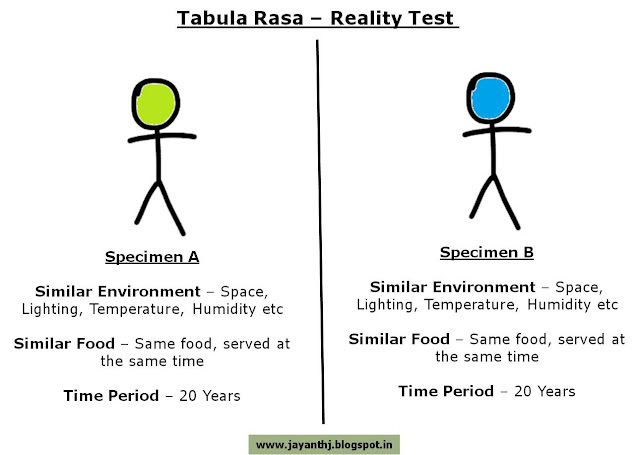 The logic of Tabula Rasa suggests that any two humans that grew up in the exact same environment would have the exact same mind. Is that what you believe? At the end of 20 years, will person A and person B react/respond to situations in a similar way? At the end of 20 years, will person A and person B react/respond to EVERY situation in the EXACT same way? Hmm.. Now, I am thinking, NO! Not always and not everything. Now, this hints at the possibility of some wild card. A factor X that has deep influence on the mind; one that is more intrinsic and individualistic to every person. Could it be the combination of genes? Hereditary factors? What would happen if we put identical twins through this test? Test two. Let's summon Charles Darwin's Theory of Evolution. Put in layman's words, Darwin postulates that that all life is related and has descended from a common ancestor: the birds and the bananas, the fishes and the flowers - all are related. Furthermore, successive generations of any species will have to be more adaptable (if not superior) than their immediate ancestors. However slight the improvisation, you are more adaptable than your parents; that's what Darwin implies. But going by the theory of Tabula Rasa, successive generations are born with a clean slate; a blank mind. This means either evolution does not apply to the mind or evolution never happened. Now, this brings us to the million dollar question. If every human being comes with the same biochemical brain composition, it stands to logic that all of us must be equally wise. No one wiser/dumber than the other. How is it that only few attain the heights of wisdom and rest end-up as bums? Is it the environment and circumstances that holds the key? Or, how we respond to the situations that maketh the man? 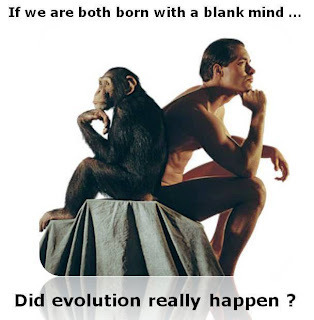 Either ways, can we really claim to have evolved? In the race to break the space frontiers and fathom the deepest seas, most of us as individuals care less about the matters of the mind. Could we have got the game wrong? What if we were meant to deep-dive not the oceans but ourselves? What if winning meant understanding yourself better than unraveling the mysteries of the universe?